First issues are always difficult. Authors have to introduce readers to the world of their story, revealing enough to make the issues satisfying while withholding enough to compel the reading of the second issue. Too often, this leads to cartoonists structuring the issue as an advertisement for the series. Nothing is satisfied, but some dramatic device—a shock or cliffhanger—serves to entice readers to continue on. Motor Crush #1 (Image Comics) has other faults, but it avoids this common error. 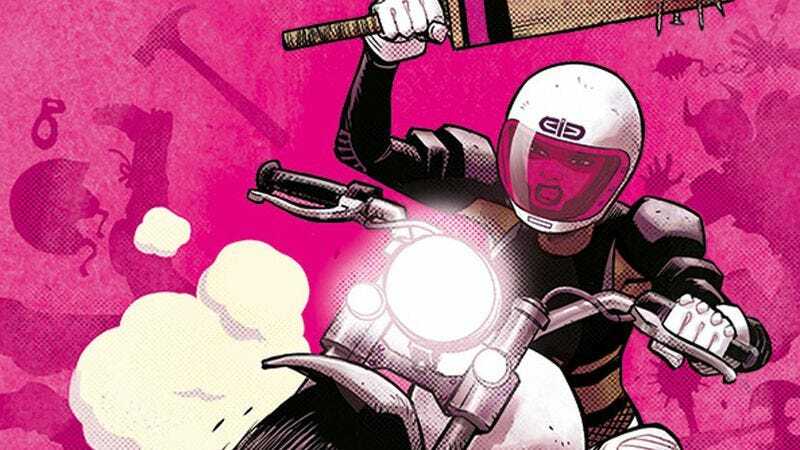 Recalling violent future-sports narratives, like Rollerball or Death Race 2000, Motor Crush follows Domino Swift, a motorcyclist balancing her attempts to crack the World Grand Prix and the more illicit world of street racing. Like their protagonist, authors Cameron Stewart, Brenden Fletcher, and Babs Tarr balance two distinct concerns: exposition and action—though, like Domino’s, their balancing act is not without hiccups. Illustrated by Tarr, with page layouts by Stewart, Motor Crush is much looser than the Batgirl run on which the team first collaborated. Tarr uses more rounded lines here, which gives her images a lucid and dynamic expression, and her inkwork is less precise; she clearly freehands much of her work. That is a boon to the comic, however, as it lends an immediacy to the page and reduces the rigidity of figures. Tarr and Stewart similarly impress with the quality of their racing sequences. Whereas much of the more expository or placid scenes feature simple page layouts with perfectly ruled rectangles, Stewart, Fletcher, and Tarr radically tilt the action-packed scenes on their axis. These scenes featured more varied quadrilateral shapes, affecting a dynamic look and feel and moving the eyes like a ball on a sloped plane. The highlight of Motor Crush, though, is Tarr’s color work. Tarr’s Batgirl run was colored with a more naturalistic palette—which did no favors for Tarr’s work—and her lines don’t particularly pop without more garish, glaring hues. Here, however, Tarr coats her figures in a bath of purple and pink, bright lights that, at points, threaten to sear out the reader’s retinas. It’s the kind of playful extremity necessary to satisfyingly complete the good-girl-art-via-Miami Vice feel of Tarr’s aesthetic. It all appears successfully sun-soaked and dreamy. Her overuse of screen tone becomes, at times, distracting, but ultimately that is a minor blemish. There’s a joke that floats around online that goes “What do you call a male Mary Sue? Batman.” There are real issues with the very idea of a Mary Sue, but the joke is spot-on. For all that Superman is the one with all the powers, Batman has more often been the deus ex machina in cape-and-cowl comics, the guy who can’t be beat, even when that means he has to correct his dislocated spine while trapped in a room meant to drown him. But what happens when you take the crazy and the rage and the money and the need driving Batman and put it in a young woman? That’s the question at the heart of Mother Panic #1 (DC), part of the recent Young Animal launch headed up by Gerard Way. Written by Jody Houser, it follows the exploits of Violet Paige, a wealthy socialite who’s maybe bent on revenge and definitely wants to clean up Gotham. Just in this first issue, she proves she’s willing to go much farther than most versions of Batman ever would, relying on a level of violence and lack of attention to collateral damage that’s more Red Hood than Caped Crusader. There’s an intelligence just under the surface of all that anger, motivation and empathy that seems limited to Violet’s interactions with her mother. The tone is more in line with Genevieve Valentine’s Catwoman run than any of the Bat-family books out right now. Houser’s name is familiar to some readers already because of her work at Valiant, most notably on Faith, but these are very different books. Fans picking up Mother Panic expecting the positive and peppy writing in Faith will not find it here. Violet has all the emotional depth and nuance that Faith does, but with far more anger and distrust. This contrast is driven home by Tommy Lee Edwards’ art. Edwards provided lines, inks, and colors for the whole book, along with creating Mother Panic with Way and Houser. His style is jagged and full of sharp angles, sketchy and covered in swaths of black. This doesn’t mean that it’s messy, but rather that there’s a sense of motion, a hint into the effort that goes into making the pages. There are some panels that are full up to the brim, others that use negative space to expertly drive the reader’s attention where it needs to go. The design for Violet’s suit is worthy of study all on its own, and hopefully will drive a lot of cosplay next con season. Few cartoonists compare to Seth, who has grown to become a master of the comic-book medium over his decades-spanning career. Director Luc Chamberland delves into Seth’s history, philosophy, and creative process in his 2014 documentary Seth’s Dominion (Drawn & Quarterly), and the DVD release takes the form of a striking hardcover containing family photographs on one side and a gallery of Seth’s artwork on the other. This supplemental material enriches the film: Seth briefly mentions his ’80s punk phase, but his words don’t say nearly as much as the picture of him posing with his bleach-blond mohawk, leather jacket, studded gauntlets, and skinny jeans, a stark contrast to the dapper look Seth embraced in the ’90s and has stuck with over time. Seth is more than just a cartoonist, and the film explores his multidisciplinary art skills, which include traditional illustration, interior design, puppeteering, and model building, specifically models of the structures in the fictional city of Dominion, which gives the documentary its title. The gallery of artwork highlights this range with comics, sketches, illustrations, and photographs of Dominion buildings, a parade float he created for the Niagara Artists Centre, and the inside of his wife’s barbershop, which he designed. The inside cover of the gallery section features one of the rubber stamp diary entries that Seth mentions in the film, and he uses his set collection of rubber stamps to recount his personal experience meeting and working with Chamberland for this project. The documentary itself is a fascinating exploration of Seth’s life and work combining interviews and other recorded footage with animated sequences that adapt various Seth comic stories. His clean, unfussy art style makes his comics especially well suited for animation, and the animation team (including Chamberland) captures the quiet power of his comics while adding smooth, but still subdued, motion to the visuals. The DVD has two additional animated shorts as bonus features (along with a making-of featurette and video of Seth speaking at the George Sprott book launch), and seeing Seth’s work interpreted for this medium has this reviewer hungry for a full-length adaptation of one of Seth’s denser works.